Beautiful and appealing long sleeve, V shape neck tunic has graceful and rich Indian embellishment work. 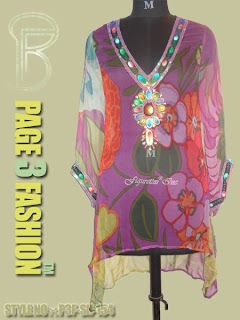 This violet color tunic has multi color flower-pattern which gives an entire appear to the wearer. Tunic has a great approach of style and comfort. • This tunic has a chic and comfortable side for wearer. • Exclusive tunic for beach and resort.